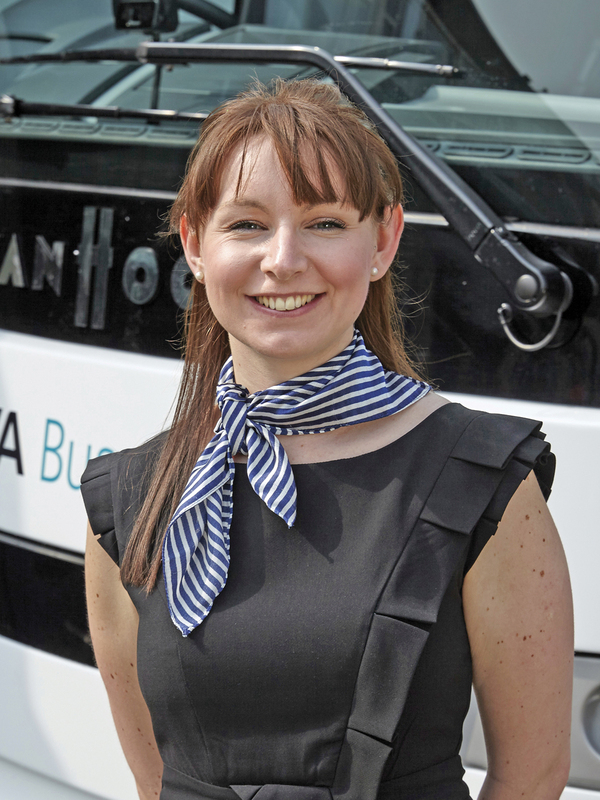 Arriva Bus and Coach has recently undergone a period of change, with a big focus on redeveloping the customer service experience. Kirsty met with Marketing Manager Laura Cooper to get a company update. The Arriva Bus and Coach team: (LtoR) David Brown (Area Sales Manager for London and the South East), Graham Messenger (Area Sales Manager for the South West), Darren Critchley (Area Sales Manager for the North and Central), Alan Dale (Commercial Director), Laura Cooper (Marketing Manager), Dave Gregory (Sales Development Manager), Steve Fletcher (Commercial Manager), Mike Jopling (Rentals Assistant) and John Gray (Area Sales Manager for Scotland and Ireland). Alan Dale joined the company on 1st February as Commercial Director and his first priority was to strengthen the sales team to support salesman David Brown. 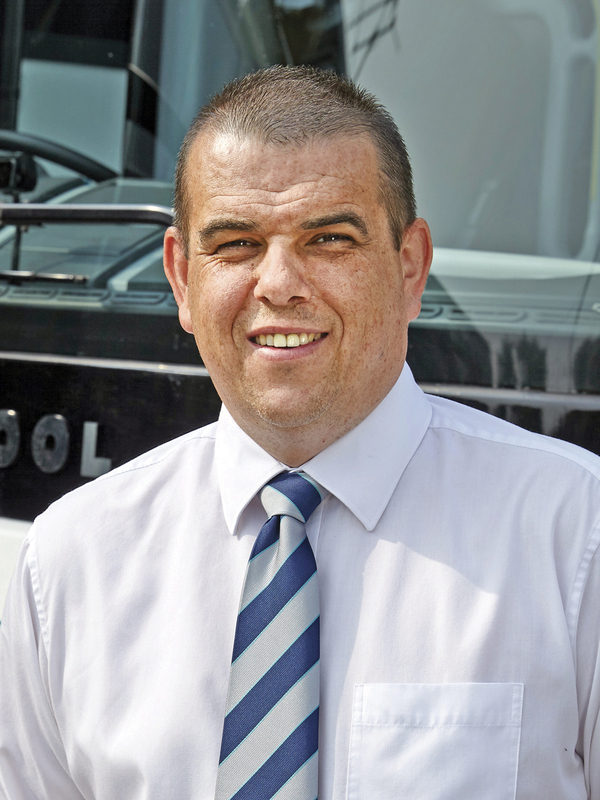 He now has a full team in place that have a variety of skills and backgrounds, some sales, some bus and coach and even a former operator, all of whom can bring different attributes to the table. Darren Critchley was the first to join the team and looks after the North, with John Gray concentrating on Scotland and Ireland. South West and Wales is covered by Graham Messenger, whilst the Midlands is supported by the latest member of the team, Bob Birch. David Brown continues to concentrate on London and the South East, the area in which he is firmly established. 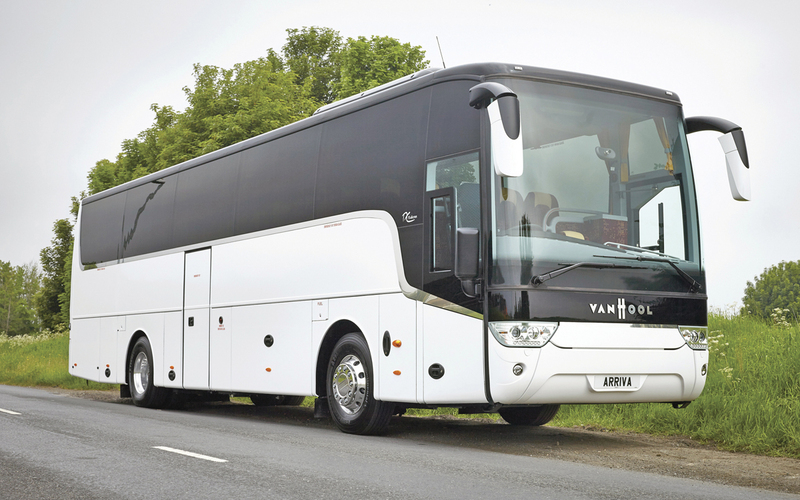 A range of Van Hool models are offered by Arriva Bus and Coach including the TX15 Alicron. 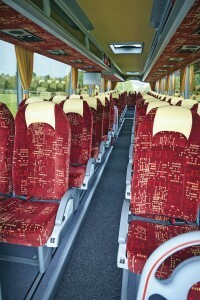 The interior of the Van Hool TX15 Alicron offered by Arriva Bus and Coach. As part of the aftersales package that Arriva provide, they have two sites, the head office at Cleckheaton, near Leeds and a second at Wellingborough, from where they offer service work as well as MOTs. At the site at Gomersall they have five pits across ten bays and an ATF lane. In addition, they have six Field Service Engineers out in their vans offering roadside assistance. They offer a 24/7 call out service and nationwide coverage. 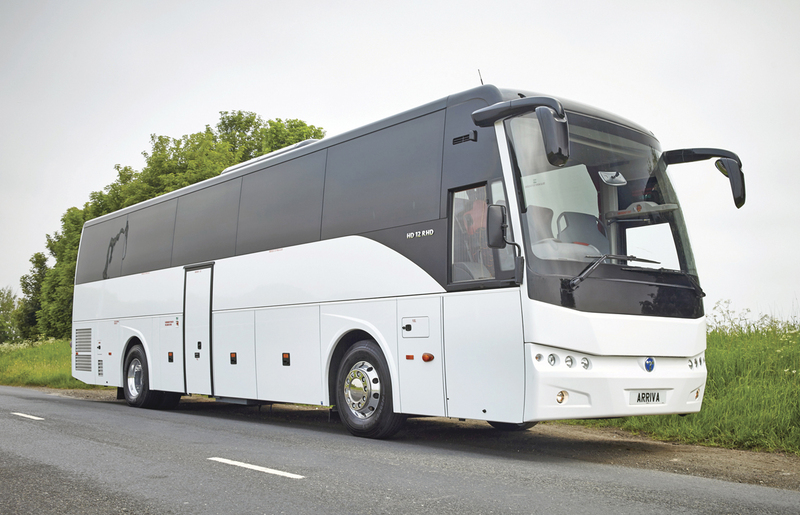 In addition to being original equipment suppliers for Temsa and Van Hool, they are a key stockist for VDL and DAF parts. They currently stock over 8000 parts and where possible, offer next day delivery. With all new large vehicles DAF driven, Marc Haley, the company’s After Sales Manager is working with the DAF Aid network to ensure that they are getting the most from their services, tailoring it towards their specific coach needs and building towards a stronger coach presence and priority. Since Laura joined the company, she has been working hard to improve the overall working environment for their employees. She comes from an industrial lubricants background and has had to ‘apply the brakes’, agreeing that the industry appears to be 20 years behind the rest of the world. She has implemented a new uniform and is constantly looking at ways to better the customer experience. The site now has a dedicated coach park, new staff parking area and new branding. The company was re-awarded its ISO 9001 Quality Management System (2015) certificate and Laura has implemented some engagement activities for employees, these include the extra mile awards, charity events and an employee forum where staff are actively encouraged to have their say. Going forward, Laura is looking at changing one of the two current reception areas at the Head Office site to a better waiting area for customers with a designated sales area, giving a more professional feel on first entering. Arriva Bus and Coach currently offer two Temsa models, the Safari (above) and the MD9 (below). This year, they have sold 45 units from Temsa, historically they have always sold around ten units and this shows the strength of the marque in the market. 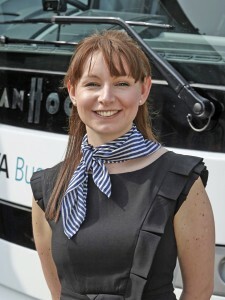 Laura said, ‘The Temsa brand reputation is changing in the UK and is doing well. They see the UK as a key market for them. They are high quality, reliable people that look after their customers.’ They will be taking another Temsa vehicle to market, trying to anticipate where the market is heading before committing to the LD, MD7 or the Maraton. Historically, customers of Arriva Bus and Coach came to purchase used vehicles and this is still an important part of its business. They don’t buy in used vehicles, the used fleet comes solely from part exchanges, which are at the salesperson’s discretion and with this in mind, the vehicle range is often vast, with some non-core products. In addition to used, Arriva offers a rental scheme on new vehicles, both long and short term, with the option of renting a used vehicle if this better suits the operator’s requirements. The company is completely flexible in this way and it is also its own finance scheme and therefore feels able to compete with other leasing companies in terms of the package offered. 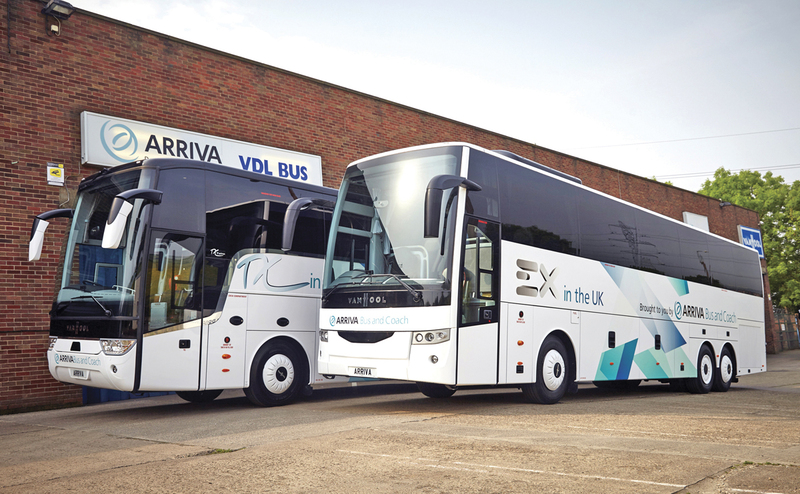 Arriva won’t specifically have their own stand, instead they will be supporting the Van Hool and Temsa brands with vehicles exhibited on both. Their Van Hool displays will include an EX 16H provided by Sharpes of Nottingham, the first of its kind in the UK, a TX15 Alicron from Reays Coaches of Cumbria and an additional EX 15H as an outside vehicle. Examples of the Van Hool TX and EX range on the forecourt of Arriva Bus and Coach’s premises. There will be two Temsa Safaris at the show. The one inside has been made into a hospitality area, with the inside removed and a bar installed. To the front will be seating and a coffee station. A second Safari will be outside for customers to see what it is like complete, along with an MD9 Max. 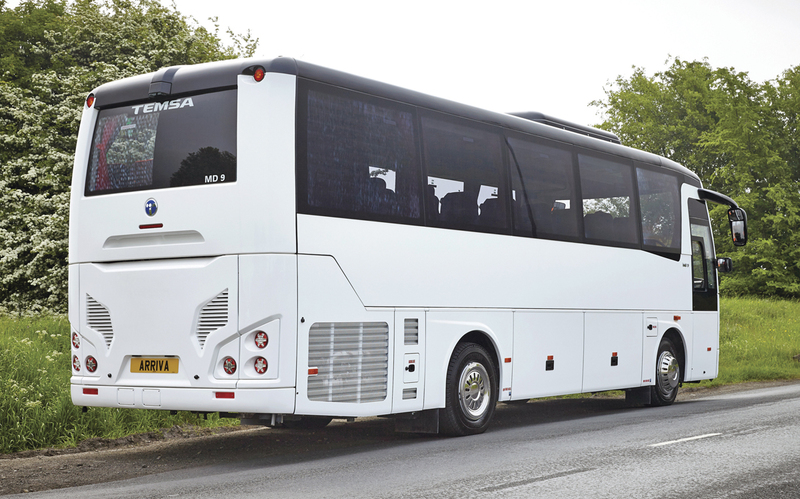 An MD9 Executive for Stephen Offord Coaches/Lynns Travel will be displayed inside and there will also be a ‘test the market’ exercise with an LD 13M which can go up to 67 seats. Arriva hope to get plenty of feedback from the market as to whether this could be the potential new addition to their Temsa offering. It will be a great opportunity for customers new and old to meet the entire team. Alan, Laura and the sales team will be on hand, along with MD Steve Hodkinson and After Sales Manager, Mark Haley. See them on stands A100 for Van Hool and J110 for Temsa. As Laura said, ‘Come and meet the team, we’re ready and raring to go’.